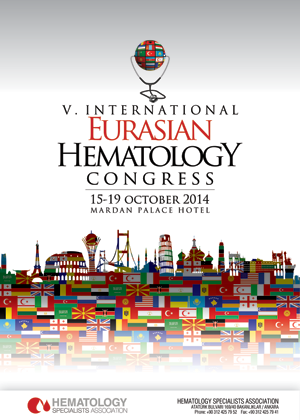 Hematology Specialists Association is an association founded by hematology specialists. Our Association, on the one hand, provides opportunities to improve the knowledge and experiences of hematologists and on the other hand informs public on hematology through organizing activities for the sake of public interest. Another main goal of our Association is to create common working platforms with our neighboring countries and to provide mutual knowledge and personnel exchange. We have mediated a number of guest academics and students to come to Turkey. Yet another aim of our Congress is to lift scientific boundaries and create common standards. Recently, our Association especially has been working very closely with the scientific institutions in some countries such as Russia, Azerbaijan, Kazakhstan, Kirghizstan, Mongolia, Uzbekistan and Ukraine. Approximately 300 foreign scientists from 32 countries and numerous local participants participated in our Congress in 2013. We strongly believe that the number of participants to our Congress in 2014 will outnumber that of 2013 and scientific sharing would continue increasingly.